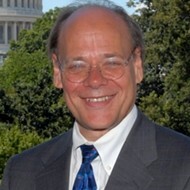 U.S. senator Steve Cohen isn't ashamed to admit that he supports legalization of medical marijuana. In fact, he appeared at a Marijuana Policy Project gala last week in Washington, D.C., with stoner icons Cheech Marin and Tommy Chong. Cohen served as keynote speaker at the 15th annual gala for the Marijuana Policy Project, an organization aimed at lobbying for reform of U.S. marijuana laws. When Cohen served as a Tennessee senator, he sponsored a bill to make medical pot legal in the state. As a U.S. congressman, he's co-sponsored several bills for medical marijuana reform. Flyer: Why did you accept the Marijuana Policy Project's invitation to speak? Cohen: I've been for medical marijuana since I was a state senator. I've had friends die of cancer. My dear friend O.J. Mitchell died in 1996, and he smoked marijuana even though it was illegal. His 88-year-old devoutly Catholic mother said, "Thank God for the marijuana. It's the only thing that gives him an appetite and a smile." Doctors can prescribe all kinds of other addictive drugs, and yet they can't prescribe marijuana even though it has nowhere near the addictive qualities. If someone has cancer, multiple sclerosis, AIDS, or glaucoma, they ought to be able to get whatever helps them from a doctor. I talked about how congresspeople need to do something to advance liberty and freedom without being afraid politically. A lot of people are afraid, and that's probably why nobody else came to speak out on that issue. Have you received any backlash for your support of medical marijuana? I sponsored medical marijuana back in the '90s, and in the 2006 and 2008 campaigns, my opponents both said I was for legalizing drugs. They also said I'm gay, but whatever. They said all kinds of things that weren't true. People know I'm not gay, and most people know the difference in legalizing medical marijuana versus legalizing marijuana [for recreational use]. What can the federal government do to allow for state's rights on medical marijuana? President Obama has had Attorney General Eric Holder issue an order to the Justice Department to not prosecute people in states where medical marijuana has been legalized. That's new this year, and it's allowed for what we tried to do by legislation to be done by administrative action. Are you sponsoring any current bills pertaining to medical marijuana? The Medical Marijuana Patient Protection Act is sponsored by Barney Frank and others, including myself, and would prohibit the federal government from interfering with states to pass medical marijuana laws. And there's an Industrial Hemp Farming Act. They've been introduced, and the odds of any of them passing are slim to none. But you still want to put your name on the side of freedom and progressive causes.